Go System. Housing plastic base (materials PBT, PA-66 or ABS) assuring extreme conditions of humidity, liquids, substance and extreme environments. The antenna concept is similar to KGEA-BFCR series, but smaller in size. The connector (sealed and unsealed) is optional and it can be customized to required features. 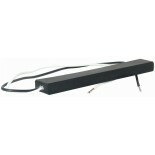 Designed to allow long emitting-reading distances in the smallest volume. High stability in temperature (-40ºC up to +85ºC). Ideally used in keyless smart entry system. Low tolerances in the resonance frequency LC. Long reading distances and average current 2-4App. Custom LCR value under demand. The specification chart is a reference guide for the most common required values at working frequencies of 125 kHz, 20 kHz and 134.2 kHz. Any other inductance value at LF or tighter tolerances can be provided. Please contact our sales deparment for any inquiry.